Nigel opened the door to his office and closed it after waiting for Kira to walk through. He walked down behind his desk and pressed the button hidden on the under side of his desk. The bookshelf slid to the side and Nigel walked through it, signaling for Kira to follow him. They walked into a narrow corridor, the walls, floor and ceiling hummed like a computer and glowed as many LED's were blinking on and off. A few meters in and down, the corridor opened up into a large laboratory. "Welcome, to my secret." Nigel said, looking around the empty room. The lab featured a large computer on the near wall, and several servers covering the far wall. The wall across from that displayed a table covered in potions and elixirs that bubbled, smoked, and cycled through a variety of colors. On the far wall, there was a large sterile chamber the only had a bed a few pieces for monitoring vital signs. "Nigel. There is an unauthorized presence in the Lab." A voice sounded through the lab. "It's okay, Rose. 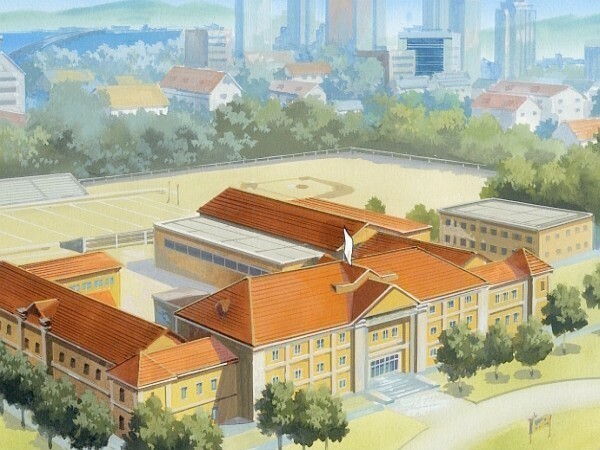 Please give Mr. Yagami clearance to access this portion of the school." He turned to Kira, "Please state your full name for Rose." Nigel said to Kira. Kira follows Nigel into his room with no knowledge of what is going on. He walks through the office door and watches the book shelf move. All of a sudden the old cartoon Dexter's Laboratory popes into his head and he whisper's "Dede get out of my laboratory ". He sees the Head master's signal he follows and when he hears the order he says "Kira Yagami" and waits for what happens next. He looks around the room and wonders what us going on. "if your making meth I'm out of here" Kira says with certainty . "Kira Yagami confirmed. Welcome to the Lab, Mr. Yagami." Rose responded. Nigel heard Kira's comment on meth and laughs. "No, I'm not making meth in here. I do that in my other lab." Nigel laughs at his joke. "No, it's here that I am able to monitor everything that goes on at this school and something big is about to happen." Nigel walks over to the computer with the screen that covers the wall. "Rose, please play the clip of Aksel at the Valentine's Day Dance." The clip rolls. What's seen is White and Aksel talking at a table. They see that White disappears in a cloud of smoke and reappears with a strange pastry that he then hands to Aksel. White also hands him a needle. There is no sound on the video at all. White looks directly into the camera before disappearing once more. Kira watches the event and thinks for a second before saying "how the hell does he do that? I know what he is doing and the physics of it; but how?" Kira was pretty sure teleportation was impossible "and what is he handing Aksel?". Kira was a little surprised at the thought of him taking drugs. While Kira wants to loud the kid into the dirt, he never thought he was stupid enough to shoot anything. "so, I have seen your laboratory worthy of Q, I have seen that this is really like big brother, I know you are a murderer and yet I have yet to find out what you want" Kira says slightly annoyed "and can you get Rose not to call me mr? It is annoying". "My apologies, Kira." Rose replied first. "Yes, you can talk directly to her. Anyway, That's not all he did. This video is supposed to have audio to it as well." Nigel walked over to the tables laden with chemicals. Nigel picked up a beaker full of the same liquid shown in the video. "This is the same," Nigel paused searching for the right word, "drug, as you called it. However, it's not really a drug at all. It doesn't impeded brain function. It enhances it, transforms it, unlocks parts of it that have long since been locked away by our earliest ancestors. In lame-man terms, it gives you power." Nigel handed him the beaker so that Kira could examine it. Kira thinks for a second and then says "so supposed to being a deppresent, it is like the ultimate stimulant...". Kira looks at the video and notices that the liquid is in a syringe supposed to a covered beaker or some thing you would drink from. "does this stimulant need to be injected or can it be drunk, and what are it's side effects?" Kira asks. Kira had the feeling it might be kind of painful but it had a great pay off. "do you just have to take it once, or do you have to take it often?" Kira asks, continuing his line of questioning. Kira holds the beaker up and examines the liquid but get's nothing out of it, it kind of reminded him of water and vodka. Nigel replied quickly, "It only has to be taken once, anymore than that has no effect. It's best if injected but, it can be ingested. However, it takes longer to take effect that way. As for side effects, it causes you to slip into a coma and systematically shuts down all your body's organs, except for your heart. It slows the rate of your heart beat tremendously without stopping it. This allows the drug to convert your DNA without destroying your body. You're in this half dead, coma-like state for an entire day while it does the work." Nigel paused for a moment. "You'd rather have it injected anyway, it has a terrible taste." Nigel smiled at him. Kira sighs and says "well, it is basically genetic science on acid". He thinks for a second and then says "if your going to inject me; where would you have me stay? If I stay in my room and someone stops by, I might be sent to the infirmary and then all hell would break loose". Kira figured the students would figure out any way, but it really did not matter to him. He reaches into his pocket, pulls out the zippo lighter than plays with the cap, lighting it every now and then. "well, may I assume you will want me to inject my self with that stuff" Kira says with a sly smile. "I'm not making you. I'm giving you a choice. If you do you will have to go up against Aksel and whatever power he obtains. No one can know for certain what power you will obtain. It's different for every person. It's not that I want you too, it's do you want to?" Nigel starred at him waiting for the answer he was sure would come out of the boy's mouth. Kira sighs and says "If you have not figured out my answer by now, it is kind of surprising". Kira smiles and rolls up his sleeve and says "let's get this over with, and I trust you will not just leave my comatose body some where anyone can see?". Kira flicked the lighter open and closes it again. This time however when he reopens it and lights it, he holds it up in front of him and watches the flame. "that potion I'd like a fire, while it gives great rewards, it is also very dangerous". Nigel smiled. "I thought you'd say yes." He watched Kira roll up his sleeve and declare he'd like to be pyro for his power. "It's completely dependent on your genetics. I can't say for certain what power you'll get. Now, if you will please follow me." Nigel walked towards the back of the room to the sterile chamber and into the first room contained a hospital gown and two bio suits. Nigel handed Kira the gown. "Please, put this on. You can leave your clothes here." He gestured to the shelf above the hangers. Nigel put on the bio suit himself. He then stepped into the next chamber that didn't have anything except a drain in the ceiling. "Close your eyes and hold your breath." he told Kira. "Rose, if you would please." "Initiating sterile chamber." she said before they were blasted with a gas that killed any and all contaminants and left a tingling feeling on any exposed skin. "Thank you." Nigel said as a door opened up to the main room. "Now, if you would lay down on the bed here I'll get started." He waited for him to lay down before attaching nodes to his chest, head, arms, and legs. "This equipment will allow me to monitor your progress while the drug takes effect. If anything goes wrong I will know immediately." Nigel was speaking without looking at Kira. When Nigel turned around again he flicked at a needle and allowed some of the liquid to squirt out before asking, "Are you ready?" Kira sighs and says "I figure as much, I guess choosing the power kind of takes the fun out of the game". Kira knew it was not a game; but he found the euphemism with the metaphor to be a good one. Kira falls in step behind Nigel and when they reach the locked room and he is handed the sterile suit Kira thinks of all of those movies with evil scientists and scenes like this. He puts his suit on and follows behind Nigel. As soon as he is told to close his eyes and holds his breath, he does so and waits for the process to begin and finish. As soon as it is he waits for Nigel and follows him out and into the third room. Kira lays down on the table and says "If I wake up with four arms and end up looking like a girl, I am going to shoot you and cut your heart out with a spoon". The reference to that old Robin Hood movie seemed kind of funny. Nigel laughed. "That would be rather difficult to do, considering my own power. I'll show it to you when you wake up." Nigel gave him a small wink. "Alright, nighty nighy, Kira." Nigel injected the serum into Kira's arm and watched as he slowly drifted off into sleep. Nigel walked back outside and sat at his computer and monitored the equipment's read outs. Everything was going exactly as it should be. Nigel picked up a beaker off the tables and walked back into the chamber when he was supposed to be waking back up. Nigel waited for him to come around before saying, "Relax a moment. You're going to feel weak from not having moved in over 24 hours. Here, drink this. It will replenish the nutrients you lost." Nigel handed him the beaker and allowed him to drink as much as he wanted. It would a good taste. The potion tailored itself to the likes of the drinker and thus tasted different to everyone. Kira feels the needle prick his skin, he winces and Begins to feel drowsy. "well it gives me some inspiration to wake up" Kira says with a laugh as he passes out. In what feels like a few minutes later Kira opens his eyes and sees Nigel standing before him. "there are a lot better faces to wake up to" he joke grogally. He takes the potion and drinks it, for some reason it tasted like a single malt scotch. As he finishes it, he sits up a bit more and feels a bit different then he did the day before. "well let's see this power of yours" Kira says in a tone back to his normal one. "Whoa. Take it easy hot shot." Nigel said, as he saw Kira getting ready to use his power. "We don't want to set my school on fire." Nigel smiled at him. "It'll be dark soon and tonight is the new moon. We'll go out to the Forest of Death and then we can practice." Nigel said to him. He got up and walked out of the chamber. Nigel sat at his computer and started typing away at the keyboard. Kira looks around and notices that a fire had started. He laughs and says "well, I guess I was right in knowing what my power is. That also explains why I feel warmer". Kira finally figured out the difference in feeling. It was odd but he will grow used to it. Kira laughs a little and says "well good, I look forward to that; however now, I want food!" Kira says. He feel his stitch grumble and says "anything I should watch out for with my powers?". "Farting?" Nigel said as Rose put out the fire. "But, seriously, anything spicy is probably a bad idea unless you think burping flames is a good idea. Anything that might give you heartburn though, I guess you don't have to worry about that just yet, hunh?" Nigel stated rather matter-of-fact like, still typing away at his computer. "Oh, there's an alcove here, "Nigel gestured to a space next to his computer, "Just ask Rose for whatever you want and it will appear here. Observe. Rose, can I have a chocolate bar please?" "Chocolate bar confirmed." There was a small hum as the chocolate appeared in the alcove and Nigel took it out and placed on his computer. "Go ahead and ask for anything." Nigel said. Kira laughs and walks over to the machine ordering tow double cheese burgers with avocado and some fries. As he finishes the food he walks over to the Head Master and says "it seems rational I should not tell anyone about this, and I should not use my power in public". Kira pulls out the lighter and flicks it open and lights it. As it lights, for a brief second the fire grows to 20 times it's original size, but then returns to normal. "if you will excuse me, I have some matters to attend to". "It won't matter soon enough." Nigel said in response to the part about using his powers in public, "But as far as this portion of the school goes, you're right. You can't tell anyone." Nigel then heard him say that he had some matters to attend to and caught his shirt as he turned to leave. "No, you can't do anything until you have your power under control." Nigel looked at the clock on the wall. "I suppose it's late enough that we can go now." he said letting go of his shirt. Kira sighs and says "well considering I managed to miss a day and have no idea about what is going on, other then I am going to have to fight Aksel". Kira sounding slightly annoyed says "this had better work, or else your school probably will be torched on accident". Kira deciding not to remove his shirt from Nigel's grip. Nigel smiled at him. "Good. Follow me." Nigel lead him out the same way they came in and out to a car that was waiting for them. It drove them outside the school's perimeter and outside the forest. Kira falls in step behind Nigel and walks towards the forest. He never really had any issues with this place, however he found a lot of fellow students that hate it.